You'll be £14.99 closer to your next £10.00 credit when you purchase Tracing Your Trade and Craftsman Ancestors. What's this? Almost all of us have a tradesman or craftsman – a butcher, baker or candlestick maker – somewhere in our ancestry, and Adèle Emm's handbook is the perfect guide to finding out about them – about their lives, their work and the world they lived in. She introduces the many trades and crafts, looks at their practices and long traditions, and identifies and explains the many sources you can go to in order to discover more about them and their families. Chapters cover the guilds, the merchants, shopkeepers, builders, smiths and metalworkers, cordwainers and shoemakers, tailors and dressmakers, coopers, wheelwrights and carriage-makers, and a long list of other trades and crafts. The training and apprenticeships of individuals who worked in these trades and crafts are described, as are their skills and working conditions and the genealogical resources that preserve their history and give an insight into their lives. A chapter covers the general sources that researchers can turn to – the National Archives, the census, newspapers, wills, and websites – and gives advice on how to use them. Adèle Emm's introduction will be fascinating reading for anyone who is researching the social or family history of trades and crafts. An excellent guide to get you researching the trade of your ancestors, pointing you to published and online resources plus how to put them into a correct social context. For the trades included you are well on your way to learning about your ancestors. For those not included you will have ideas of where to look. This book is especially strong on books and other media that offer insight into the professions themselves, workers' pay and conditions and the traditions, customs and rituals associated with them. These are found in the text, with web addresses usually in bold and in a select bibliography in an appendix. There is also a chapter with brief paragraphs on other related genealogical resources and how they complement the more specialised ones. This book would be useful for anyone who has got a little way into their family tree and, thanks to the Victorian census, has come across one or more family members with a trade. Much as we might fantasise about noble ancestry, behind most of us lie generations of ordinary folk, toiling day by day to raise their families. But exploring those 'ordinary' lives brings rich rewards. 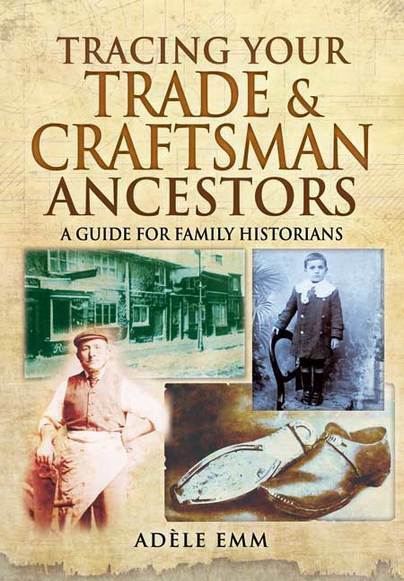 Here long-standing family historian Adele Emm helps us do just that, with this helpful guidebook to understanding and researching a vast array of trades and crafts. Naturally she explores the world of medieval guilds and systems of apprenticeship, as well as other related topics such as holidays, pay and pensions. The bulk of the book then delves into different categories of trade, under the broad headings of merchants, shoemakers, and the textile trades, among others. Inevitably, the sheer range of trades in the past means that some can only be touched on briefly - milliners get a paragraph, for example - but this nonetheless makes for a valuable quick reference guide to trades in times past. Deserves a prominent place on any family historian's bookshelf.